Come to the Fair – and see the amazing pedal-driven rice-thresher!! 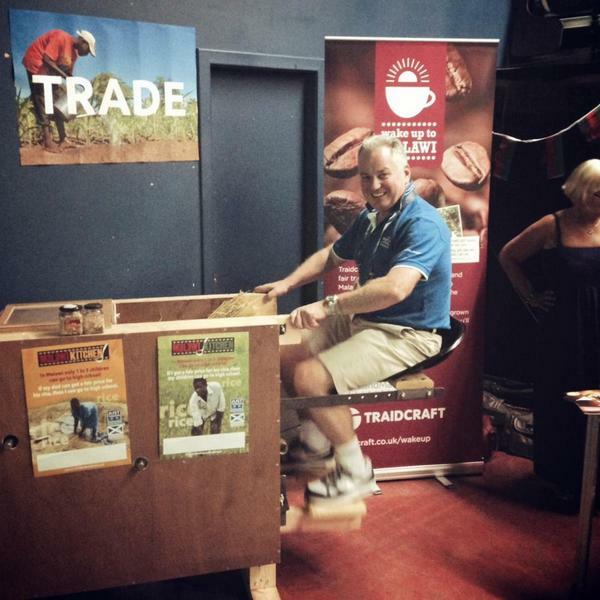 The Dumfries Fairer World Fair on Saturday 1 November will be a unique opportunity to see a pedal-driven rice-thresher that has been designed and made by a local businessman for rice farmers in Malawi. Just Trading Scotland import Kilombero rice from a fair trade project in Malawi. When two of the rice farmers, Howard and Henry, visited Dumfries last year they had the chance to meet with Paul Tofield, who runs an agricultural supplies business in Dumfries. Paul has a keen interest in the history of agricultural mechanisation and suggested that he could make a rice threshing machine that would be driven by pedals. Both Howard and Henry were happy to accept the offer and intrigued to what the outcome may be! In Malawi, and in fact most of Africa, farming is done by hand or simple tools. Threshing is an important part of rice production, however threshing by hand is very laborious and also wasteful as there is a high volume of product spillage. Several months, ideas, lots of planning, and a few prototypes later the threshing machine was complete. The threshing machine will now mean that the process of threshing is a lot more efficient, easy to operate and should prove labour and cost savings. Currently there are three completed and ready to be shipped to Malawi. We are excited to see the threshing machine that Paul has made – it is a great illustration of the link that fair trade makes between producers in developing countries and consumers in this country. The Fairer World Fair is always a great way to start your Christmas shopping and know that the producers and farmers are getting a fair price for their work. In addition to the thresher, there will also be several stalls with Fair Trade and fairly traded foods, gifts and crafts from around the world, a café with home-baking, and we are also showing a number of short films about Fairtrade, complete with a popcorn stall. The Fairer World Fair is at St George’s Church Hall, Saturday 1 November, from 10am to 2pm. Admission is free.